Anil has won the lottery and must decide what to do with his 10,000 rupees. He has altruistic preferences: while he is pleased to receive the money, he also cares about his neighbour Bala who did not win anything. We can use the technique of constrained optimization to model his decision. where is his production function. At Alexei’s optimal point, the rate at which he is able to exchange hours of free time for grade points is equal to the rate at which he is willing to exchange them. In other words, the marginal rate of transformation (MRT) equals the marginal rate of substitution (MRS). We referred to this as Alexei’s first-order condition for optimization. The equation describes the feasible frontier along which Anil can split his lottery prize if none of the money is lost or taxed. 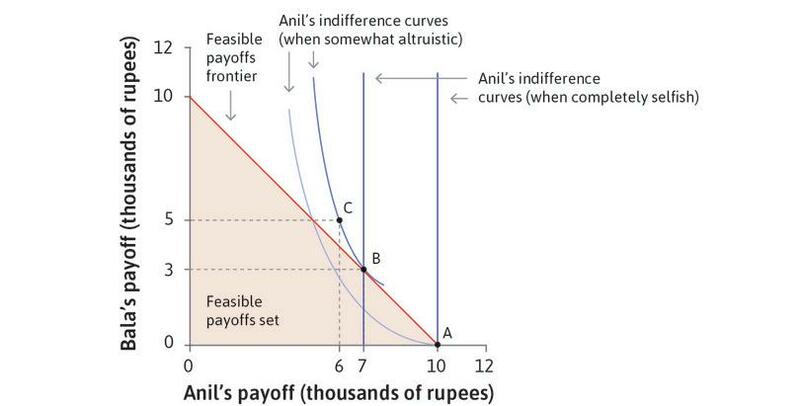 You can see this in Figure 4.5 of the text, reproduced as Figure 1: the optimal allocation lies at the point of tangency of Anil’s indifference curve and the constraint (feasible frontier). Anil’s optimal allocation when he is altruistic. Figure 1 Anil’s optimal allocation when he is altruistic. For example, if Anil’s preferences are such that and , these expressions reduce to and as in the text: Anil gives 3,000 rupees to his neighbour Bala, and keeps 7,000 rupees for himself. A quick check of the algebra above should convince you that the optimal shares remain and if is replaced by any other positive number: the proportions of the prize allocated to Anil and Bala are independent of its size. Notice also that this answer enables us to do something we have not done up to now, namely to give some interpretation of the parameters and of Anil’s utility function. The higher is relative to , the more Anil cares about his own money relative to Bala’s. Another property that you can observe here is that only the ratio of to is relevant for Anil’s optimal choice. He would make the same choice if and because his indifference curves would have exactly the same shapes, although the scale on which utility is measured would be different. These features of the solution are consequences of Anil having a Cobb-Douglas utility function. With a different type of utility function he might split the money in different proportions depending on the size of the prize. Read more: Sections 15.1, 17.1, 17.3 of Malcolm Pemberton and Nicholas Rau. 2015. Mathematics for economists: An introductory textbook, 4th ed. Manchester: Manchester University Press.